Often, especially when measuring on big facilities, you are given a limited amount of time. So when it comes to measuring the sample and the background, this limited time has to be divided between a measurement of the sample, and a measurement of the background. Normally, one would spend about 50% of the time on a sample, and 50% on the background, or even more time on the background “because the counts are so low” (I know, I did the same!). There must be a better way to calculate the optimum division of time! So me and a colleague, Samuel Tardif, spent a little bit of time jotting down some equations, and plotting the result. 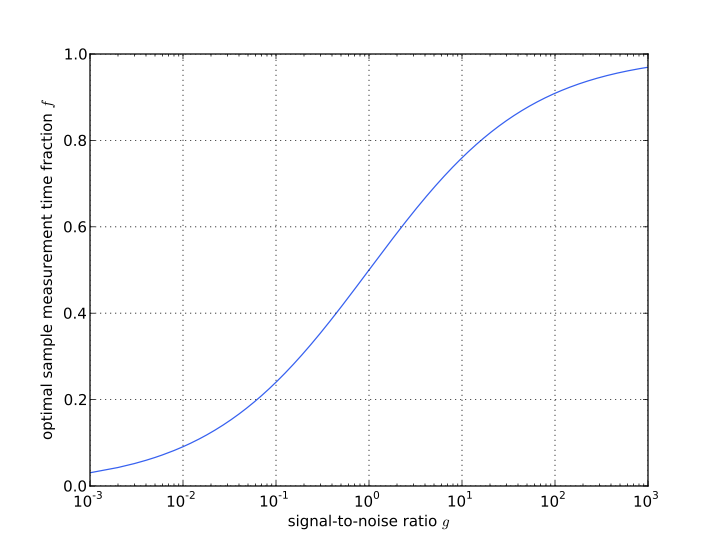 The result is that for large differences in the signal-to-noise ratio (c.q. sample count rate to background count rate), significant reductions in uncertainty can be obtained through better division of time for any small-angle scattering measurement.